Momma Told Me: Children should be seen, not heard. This time of year it can be hard to balance that quality family time with the seemingly never-ending list of holiday preparation. These next few weeks can be precious time for a mother, with Winter Break fast approaching. I know I find myself running to and from stores before Sabrina (11) gets out of school, planning where to hide gifts and attempting to fit in mi-afternoon wrapping sessions between meal plans and grocery shopping. As if it weren't bad enough, children find themselves bursting with extra energy, enthusiastic for the upcoming holiday, and tend to cling to the adults in their lives every chance they get. As much as we love them, we simply need a few moments of time for communicating with Santa and double checking our own Naughty or Nice list. I often feel guilty when Sabrina's pencil hits the table, done with her homework for the day, and I'm still rushing through the house preoccupied with holiday prep. Not all gifts have to be saved for the holidays; investing in a few smart kids crafting products can really help save your sanity, and keep your child feeling engaged without feeling left out. If you don't have time to tarp the dining room table for reindeer hand print paintings, consider much cleaner, self guided, crafts like Glitter Petz and Plusheez from Orb Factory and Artsi. Artsi is a new range of interactive toys that encourage young girls to express their creativity through the creation of their own toys. Not only do they get to spend some time personalizing the decor of their craft, but the end result is a beloved toy they will play with for a while to come. 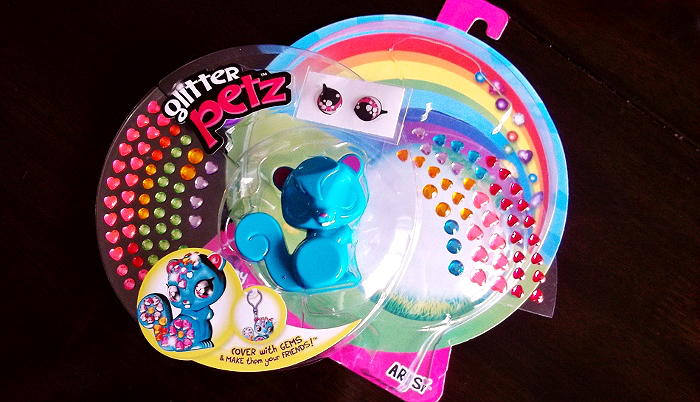 Glitter Petz come in 6 animal varieties, from a pink pony and an orange fox, to a purple feline and blue squirrel. All have adorable character names, except for 'Squirrel' who is aptly named just that. 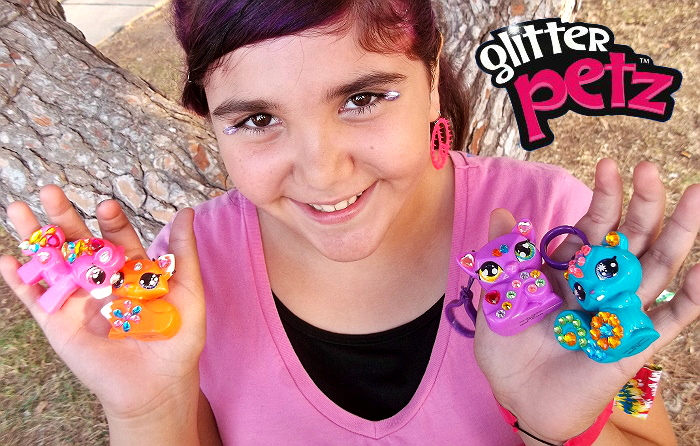 With a retail price of just $6.99, and a package that contains 100 sticky gems, 1 figurine, 2 sets of sticker eyes, and a string clip, these are an affordable option to occupy girls aged 6-13. If you buy several kits, or the entire collection, you can occupy multiple young girls for well over an hour, trading different shapes and colors of gems to create the perfect masterpiece character. And, while these gem stickers are quite secure, they could easily be peeled off and exchanged to create a new design later. There certainly are plenty of extra gems to do so! Sabrina even enjoyed placing a few on her face as beauty decorations when she was done. She told me that all of the 'sparkle' made her feel like a queen! Artsi has also released it's own line of colorful characters in the Plusheez range of push crafting. We're no stranger to the Plusheez collection in this house, as Sabrina owns 7 different Plusheez creations, and always lights up with excitement to get her hands on a new one. To match her Glitter Petz fox, Sammi, we went with the new Plusheez Pals, Zoey the fox this time. By now Sabrina (11) knows how to complete these push crafts on automatic, but especially loves when they come with a push-by-number guide that increases the difficulty a little bit. 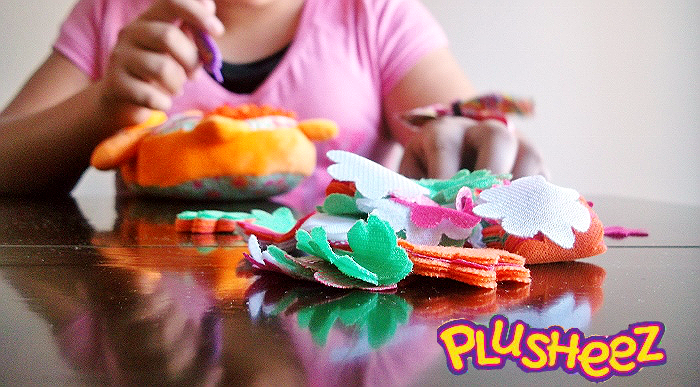 These Plusheez Pals are designed to be engaging for ages as low as 6, so this particular craft didn't have a number guide, but a suggested color pattern printed on the stuffed animal itself. For those unfamiliar with Plusheez, they are pre-stuffed animals, pillows, and more which come with tiny fabric flowers and plastic push pin. 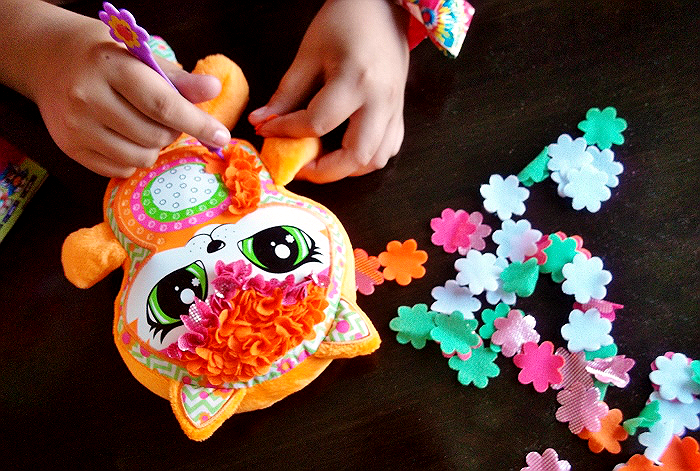 Children use the plastic stylus to press the fabric cut-outs into pre punched holes in the plush character. The result is a textured, 3 dimensional, finish that enables kids to follow the chosen pattern or be creative and make their own. Sabrina finished her Zoey character in about 30 minutes, where as the original collection of Plusheez usually take her an hour and half or more. None-the-less, she loved that this was an actual stuffed character, with swinging arms, legs, and even a tail. Much like the other Artsi products, this Plusheez range can easily be interchanged at a later date,should she choose to remove some of the fabric press-ins and change the pattern or color of her plush craft. The Artsi range of products for girls 6-13 can be found nationwide at retailers such as Walmart, Jo Ann's, Meijer and more. If you are looking for crafts suited towards the younger range, check out the Artsi Stickeez collection, which offers similar simplistic kits as well as more engaging (400pc) kits for the tweens. Stickers are a hit with all ages, I know I never grew out of my love for them, and these products are sure to be a huge hit in your house this holiday season, under the tree, or in the living room occupying little hands! What Daughter Says: Don't feel guilty this holiday season, occupy little ones with engaging kits and creative toys. 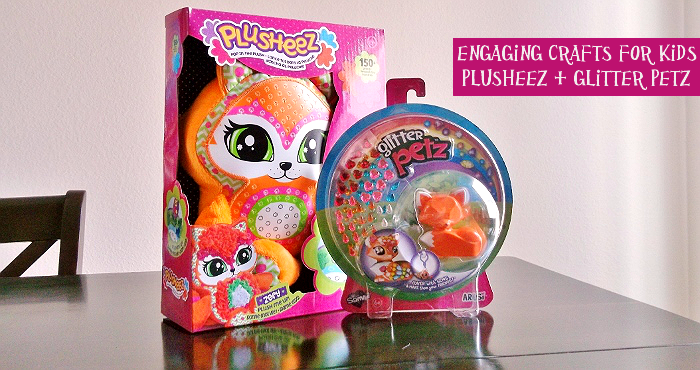 One Momma Told Me reader will win a Plusheez and Glitter Petz prize bundle from Artsi! Wow, those are perfect for keeping my kids busy over Christmas break or on a snow day. THANK YOU -- for the peace I'm sure to enjoy when they use these. The Stickeez all look like a lot of fun! I think my daughter would like theStickeez Treasure Boxes. 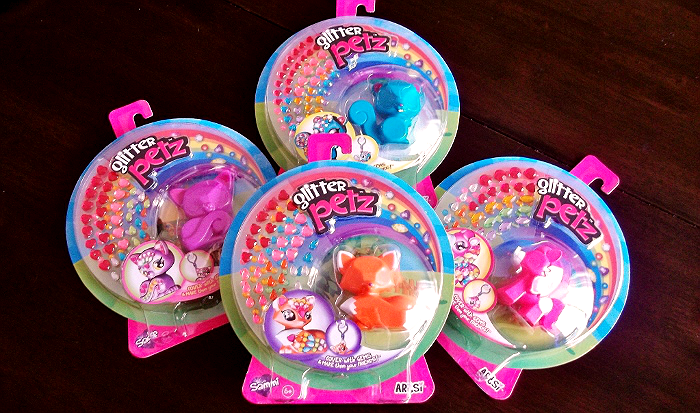 My girls would love the Stickeez clutch and bling bands for sure! 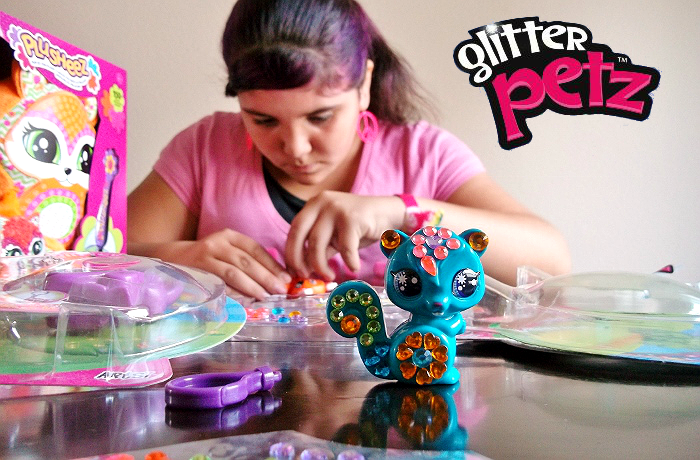 She'd like the Stickeez™ Bling Bandz. Thanks. 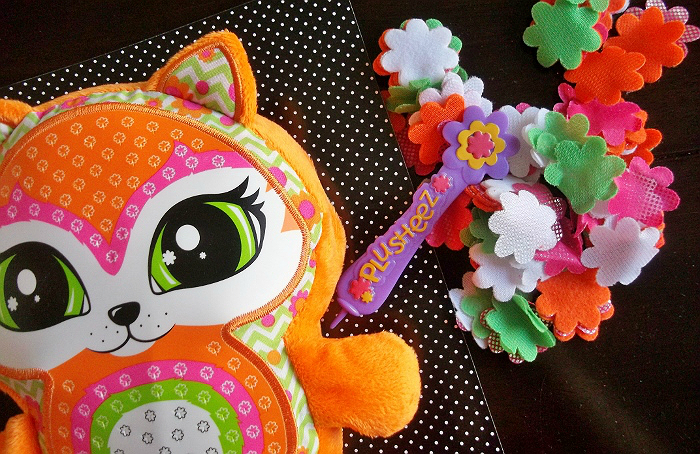 My granddaughter would love the Stickeez™ Clutch and it would be a simple project for her. My daughter would like the Stickeez™ Mini Princess. I think my daughter would like the Stickeez Treasure Boxes. My daughter would also like the Stickeez Cute Candy Stickers. 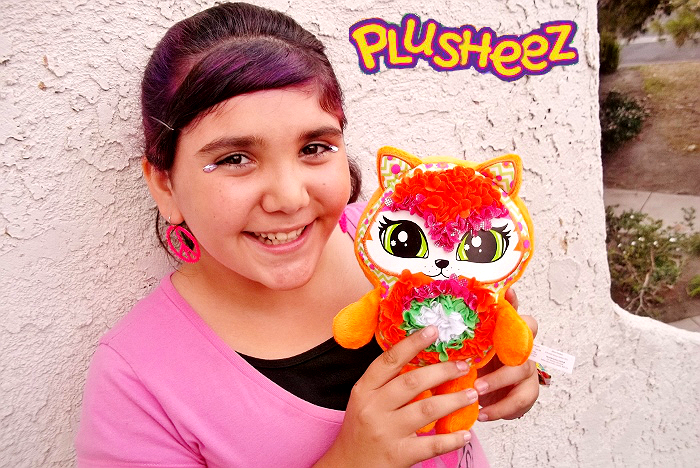 My daughter would love the Plusheez® Pals Bella. I also like the Stickeez™ Clutch. Thanks! My daughters would love the Plusheez Pals Bella! Not only is it adorable, but they love owls, so it would be perfect! My daughter would love the Stickeez™ Clutch.